The academic structure is a representation of academic actions approved through governance and should be used as the single source of truth for approved governance actions. Each component of the academic structure has a foundation in policies from the UW System Board of Regents, UW-Madison Faculty Policy and Procedures, and accreditation bodies. The official academic structure is maintained in the student information system (SIS) and is accessed electronically through the data extracts from the InfoAccess data warehouse. Responsibility for maintaining the academic structure in the single source of truth is shared by APIR and the Office of the Registrar. Makes it clear how schools and colleges are related to departments, how departments are related to academic plans and subplans and how departments are related to curricular subjects. Defines how elements of the academic structure are related to budgetary units. Enables the electronic connection between data systems that consume the academic structure and saves the time and resources that would be needed to maintain separate systems. Ensures consistency in reporting about the academic structure by maintaining a single source of attributes of departments, plans, subplans, and curricular subjects. 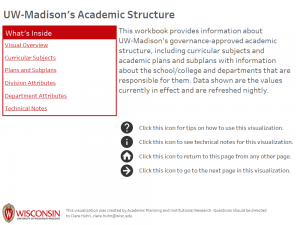 The image below links to a Tableau workbook that gives a visual overview of UW-Madison’s academic structure that can be filtered to the school/college and department level. Clicking on the image will open the workbook.